I wrote recently that as a result of my surgery I am not supposed to have red meat for three to six months after the procedure. I also wrote that I wasn’t thrilled about a diet of strictly poultry and seafood, and that I was going to want to include some vegetarian cooking in the mix. While my sensibility, as I wrote, is that if you are going to cook vegetarian you should cook vegetarian in and of its own right and not try to emulate meat, I am nonetheless not adverse to a good veggie burger or using soy crumbles to make vegetarian chili. 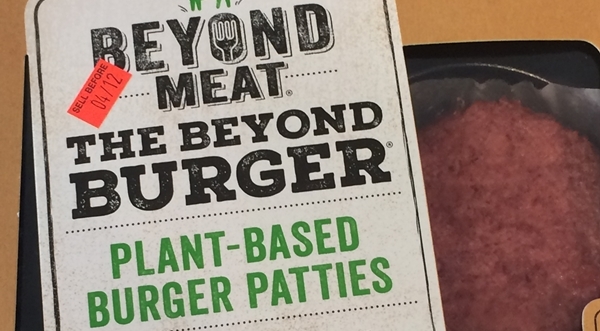 A former manager of mine read the blog and noted how much her family loved the Beyond Burger. I was familiar with it because the Carl’s Jr. fast food chain had been heavily advertising the product on baseball television broadcasts. Their version is the Beyond Famous Star. What I did not know was that the uncooked Beyond Burger is available in the grocery store. I was doing a major shopping trip at Winco, our local discount bag-your-own-groceries supermarket and I found the item in the meat department. I bought a package and grilled one of the burgers on our new stove’s grill top. I buttered a slice of sourdough bread, sprinkled it with Parmesan cheese, and added it to the grill. 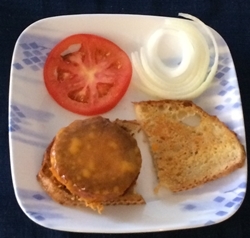 I added mustard to the bread and topped to burger with tomato and onion. The result: marvelous. It tasted just like a beef burger and was just as satisfying, although it didn’t stay with me as long. It’s a bit expensive: two patties cost me nearly six dollars, but it’s a really nice treat. I still want to try the Carl’s Jr. version.